On July 5, we posted detailed analysis with 5 reasons we were monitoring NASDAQ 100 for potential short sale entry. Rather than selling short $QQQ, the swing trade setup called for buying the inversely correlated and leveraged UltraPro Short QQQ ETF ($SQQQ), which moves higher when NASDAQ 100 moves lower. $SQQQ triggered our buy entry that same day, as it moved above the prior day’s high, but the ETF reversed sharply lower and formed a bearish candlestick pattern on July 6. Just three days after buying $SQQQ, the momentum swing trade hit our protective stop, knocking us out of the trade with a loss. As you can see, the trade obviously failed to work out as expected, but there is plenty to learn from the trade, especially if you are a newer trader. Even if you are an experienced trader, you will find the following three points to be crucial reminders to keep you on track from day to day. In reviewing the $SQQQ trade, we still believe there was certainly enough evidence to support the entry, but the trade moved in the wrong direction regardless. Although you could pontificate for endless hours about why the trade failed, doing so would be a waste of time because the actual reason the NASDAQ 100 (and $SQQQ) failed to follow-through as expected simply does not matter. What does matter is understanding and truly accepting that losing trades are part of the business, and you can not have winning trades without losing ones (run fast from anyone who tells you otherwise). When losing on a trade, it is absolutely imperative to quickly lick your wounds and put the trade out of your head. Realize that a losing trade always puts you that much closer to the next big winner, so stay positive and focus on new trading opportunities in front of you. If you drive a car while staring in the rearview mirror, worried more about what’s behind you than in front, you will crash! Our goal with each and every stock trade is to have a plan in place prior to the entry, and stick to the plan while in the position (which we did with $SQQQ). 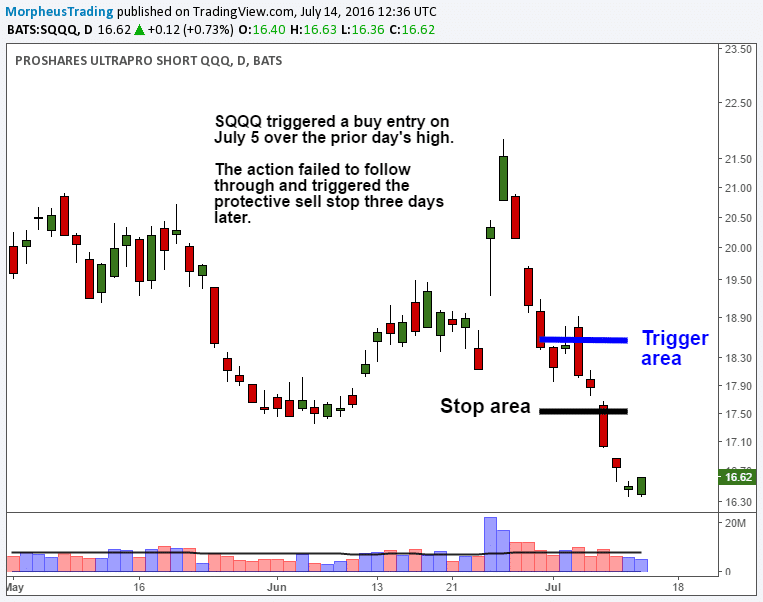 As detailed in the blog post, our $SQQQ stop was roughly 3% below support of the July 1 low. On the morning of July 8, $SQQQ hit that stop and subscribers of our trading newsletter already knew the plan with our preset trade parameters. This was a non-negotiable exit, especially since the trade was taken on the short side of the market. The key to making the math work for consistent trading profits over the long-term is to be disciplined with money management, specifically with regard to proper position sizing and cutting losses quickly. No single losing trade should ever ruin your month or put your trading account under pressure. If it does, you are likely trading too large of a position size or not honoring your protective stops. Just how much capital to risk per trade largely depends on your personal risk tolerance, but risking 0.5% to 1% of account equity per trade (the amount lost if trade hits your stop) is a reasonable guideline for an active trader/investor. Cutting losses is every bit as important as proper position sizing. If you can not cut a loss when a stop is hit, then it doesn’t even matter if proper share size was taken. For consistently profitable traders, cutting a loss should be easy most of the time (we say “most” because humans occasionally make mistakes). On the other hand, traders with a faulty mindset may find cutting losses to be a challenge, especially if psychologically taking the losses personally. As the Wall Street adage goes, it is OK to be wrong, but not OK to stay wrong. It’s easy to find yourself losing objectivity and becoming emotional over a trade, especially when overly convinced that a losing trade should have worked out for whatever reason. But emotional trading leads to subjectivity. If left unchecked, being subjective about trading, rather than technically objective, can set you up for a vicious cycle of losing trades. For example, some traders who sold short the NASDAQ through buying $SQQQ with us on July 5 may have exited the trade, but jumped back in and attempted to re-short the market this week without any valid reason. Having and following a trading system with a consistent process is crucial, as it will help prevent (not fully eliminate) emotional decision-making. When you truly understand that losing is a normal part of the business, you can clearly move on to the next trade and remain objective while following your plan for every new trade. This is exactly what we did by buying $BABA in The Wagner Daily on July 11 (around $79.90). Our market timing model generated a new “buy” signal shortly after stopping out of $SQQQ, so we objectively followed it. Putting this all in perspective, $SQQQ was merely one single trade out of a hundred or more equity trades we make every year (depending on market conditions). If you have a proven trading system that works, and each new trade entry is valid according to your system, then every trade is good…regardless of the short-term outcome of any individual trade. As with any discretionary system, some trades will be better than others (we are humans, not machines), but a winning system should produce positive results over several hundred trades, so don’t sweat the losing trades if you’re doing everything else right. The original article is authored by Deron Wagner, appears on morpheustrading.com and is available here.